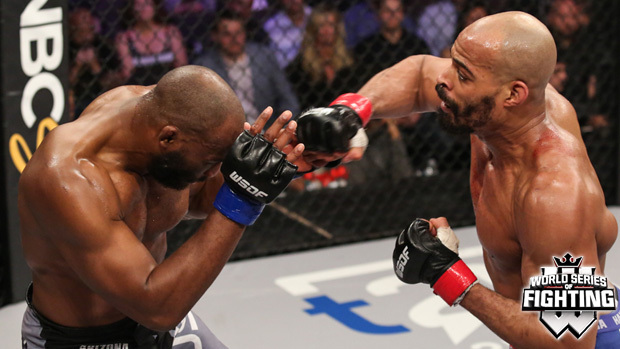 In the night’s main event, two-division titleholder David Branch was set to make the first defense of his light heavyweight belt as he took on fellow UFC veteran Clifford Starks. Branch, who also holds middleweight gold, extended his current winning streak to seven with a first-round submission finish of Teddy Holder at WSOF 23. Starks, meanwhile, entered the title affair having won five straight, including three inside the WSOF cage. Branch, one of the most diverse fighters in the world, has worked very hard to have a tool box that can win him a fight that takes place on a lot of different planes. A strong jiu-jitsu and striking game, Branch has transformed himself to a high level wrestler. On this night, it was a high level wrestler who stared across the Decagon at him, and it was high level wrestling that he would need to dictate the terms of his championship fight with Starks. That’s precisely what he did on this night, in retention of his middleweight title. Taking Starks down throughout, the champion had the former ASU standout zigging when he should have been zagging. The seemingly quicker, stronger man throughout, Branch had a fight with the lone hiccup being the illegal knee in the second. Branch channeled his inner Georges St. Pierre and was just better everywhere. In victory, the champion credited the challengers durability as a reason for the lack of finish. Up next for Branch, World Series of Fighting action returns to NBCSN on Saturday, Oct. 7, with an unprecedented, three-hour telecast and world championship doubleheader, beginning at 11 p.m. ET/8 p.m., from Kansas City Municipal Auditorium in Kansas City, Kan. In the light heavyweight (205 pounds) co-main event, reigning world champion David Branch (16-3) of New York, N.Y. will defend his title against fellow Brazilian Jiu-Jitsu black belt and battle-tested veteran Vinny Magalhaes (14-7) of Las Vegas, Nev. via Rio de Janeiro, Brazil.